When it comes to animal control and removal, it’s extremely important to contact a professional service as soon as you think you may have a problem or concern. There are an extensive number of safety risks associated with animal removal, from something like falling when trying to reach a high elevation, to potential bites from the animal in question. Even a scratch that occurs from trying to remove wildlife from your home can be detrimental to your health and possibly deadly. In addition to personal safety concerns, there are laws in place to ensure the ethical and humane treatment in these situations, all of which the Stryker team is well-versed and trained to adhere to. When you take the matter into your own hands, you’re facing potential legal problems. At Stryker, our team, with many years of experience in the industry, has the know-how to remove animals not only safely, but also efficiently, ensuring your life gets back on track, without the fear or worry associated with animals and wildlife, including rodents, birds and reptiles. 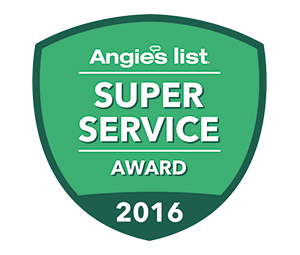 Stryker Pest Control is a locally-owned and operated family business, and our owner performs much of the work himself, which means we’re going to give you a level of personalized attention you’re not likely to receive when you contact other Columbus companies. This also means we take the time and effort to create a customized approach to the treatment of your unique animal control issues. No two homes, businesses or property owners are exactly alike, which is why we don’t offer you a one-size-fits-all approach to your animal control or pest control services. We perform a comprehensive inspection, and based on the results of that inspection, we’ll then develop a plan of action that’s ideally suited to your individual needs and preferences. In addition to eliminating your current animal control and pest issues, at Stryker we want to create long-term solutions that will keep you pest-free in the future as well. We’ll help you eliminate possible areas of weakness in your home that make an animal infestation a likelihood, and we also offer a variety of different plans that can save you time and preserve your peace of mind. At Stryker Pest Control, one of our primary areas of expertise is in the field of animal removal and control. Raccoons are medium-sized mammals that usually are 2–3 feet in length and weigh 10–30 pounds. They are easily recognized by the distinctive black “mask” over their eyes and a black-and-gray ringed tail. They can be found in many habitats, including parks, suburban areas, and farms. In these areas, they will den in hollow trees, ground burrows, brush piles, barns, buildings, dense vegetation, haystacks, rock crevices, or chimneys. Raccoons also eat a wide variety of foods, such as small mammals, birds, snakes, lizards, insects, acorns, fruit, corn, and grass. 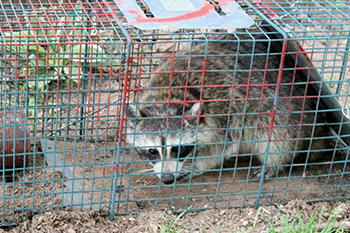 Raccoons can transmit rabies, canine distemper, and parvovirus to domestic animals and humans. The head of a groundhog is broad and flat with small ears and eyes. The coarse fur is usually grizzled grayish brown with a reddish cast. The legs and feet are typically dark brown to black colored and are well suited for digging. Immediately after coming out of hibernation the male seeks a mate. After mating with one female, the male will usually search for other females to copulate with. Some males will stay at the burrow site until the female drives him off shortly before she gives birth to her young. Breeding season lasts from March-May and gestation lasts 31-32 days. The young are born from April-early June. The naked, pink, and helpless newborn groundhogs weigh about 1.5 ounces. In the following few weeks the young will grow rapidly. Litter sizes range from 2-7, but consist of 4-5 young on average. When the young are 9-11 weeks old, the den will be overcrowded and the female will drive them off into nearby burrows, but she will continue to care for them. She will guide them in their development until they leave the territory to create territories of their own. Ohio has three species of venomous snake. That is three species out of the twenty five snake species that call Ohio home. They are the eastern massasauga rattlesnake (Sistrurus catenatus), the northern copperhead (Agkistrodon contortix) and the timber rattlesnake (Crotalus horridus). Unfortunately, due to habitat loss, road mortality and persecution, both the timber rattlesnake and massasauaga rattlesnake are listed as state endangered species and can only be found in very specific locations in the state. Vertical pupil vs round pupil - All of Ohio's venomous snakes have vertical, cat-like, pupils. 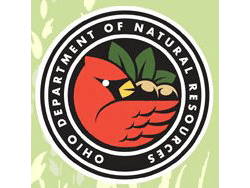 Ohio's nonvenomous snakes do not, they have round eyes. Presence of a facial pit - All of Ohio's venomous snakes are pit vipers. They have a heat-seeking pit that helps them localize their prey. The are ambush predators, and will sit and wait for a small rodent to run by, sometimes at night, and their pits help them hunt. Ohio's nonvenomous snakes do not have these heat-seeking pits. Triangular head vs Rounded head - It is true venomous snakes often will have a triangular head. Many nonvenomous snakes will flatten their neck and change their shape slightly to look more triangular. The opossum is a whitish or grayish animal the size of a house cat with a naked, rat-like tail. Its face is long and pointed with rounded, hairless ears. The opposum grows up to 40 inches long and can weigh up to 14 pounds. The average is 6 to 7 pounds for males and 4 pounds for females. Its tracks look like they were made by little human or monkey hands. Opossums prefer to live near streams or swamps. They den in the burrows of other large animals, in tree cavities, in brush piles, and under sheds and buildings. They eat nearly everything, from insects to fruits, grains, garbage to pet food. Opossums are mostly active at night. They may raise two to three litters per year. The main complaint against opossums is that they get into garbage, bird feeders, or pet food left outside. Two kinds of skunks may become pests. The striped skunk and the spotted skunk. The striped skunk is about the size of a large house cat and has two broad white stripes running from the back of the head to the large, bushy tail. Spotted skunks are about half that size, with four irregular stripes beginning behind the eyes and below the ears. Skunks are mostly nocturnal. They do not hibernate but may sleep through cold weather periods. They usually live in underground burrows, hollow logs, or rock piles. They may decide to live under houses, sheds, cabins, or storage buildings. The main problem with skunks is their odor. They become pests when they change their dietary selection from rodents, insects, and wild fruit to garden crops, garbage, and lawn insects, and locate their habitat closer to humans. Another major problem is the transmission of several diseases including rabies. There are many types of squirrels. Tree squirrels are found in forest areas throughout most of the United States. Many species have adapted well to suburban and city life. Occasionally, squirrels enter buildings and cause damage or disturbance. The common species that become pests are the gray squirrel, red squirrel, flying squirrel, and fox squirrel. Tree squirrels usually build their nest in trees. They also may store food and find shelter in attics and garages. One of the primary ways squirrels become pests is by scrambling around and crutching inside attics and wall voids. They may travel power lines and short out transformers. They like to gnaw on wires, causing a fire hazard. Squirrels may gnaw through siding and shingles, too. Squirrels will come and go each day. Common points of entry include damaged attic louvers, ventilators, soffits, joints of siding, and many more.